Moving into a care home is a big step, not just for the person going into care but for the whole family. Many emotions come to the fore. Sometimes you also have to feel your way through the process, as you’ve probably not had to do it before. Many care homes, whatever their type, also provide care for EMI residents. If that’s the case, it will be mentioned in the information provided by the home. Regardless of whether you’re paying care fees or not, it’s a good idea to take financial advice from an independent financial adviser. This will help you look more broadly at the options open to you – and ensure you protect your assets as much as possible. The earlier you can do this the better. Choose an adviser who specialises in long term care planning AND who also understands the state benefits you’re entitled to, including NHS Continuing Healthcare. Remember, if you need full time care for health needs, you do not necessarily have to pay for your own care! Read more about paying care fees. This is a vital document! Read more about Lasting Powers of Attorney. This is another vital document – and it’s crucial to keep it up to date. Find out more about making or updating your Will. Ask the vital questions most people don’t ask – but should. 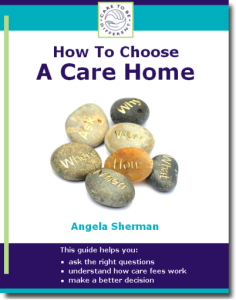 This 39-page practical guide shows you what to ask, when to ask it and how to make a better decision when you choose a care home. You’ll save time now – and avoid unnecessary care costs later. We have an issue . Our father has a Deprivation of Liberty Safeguard (DoLS) in place but also now has a health Power of Attorney (POA) aswell. I used it to ask for the medication list and the Office of the Public Guardian (OPG) have contacted us to say a complaint has been made. It has been made by the home but do you know about the relationship between having a DoLS and also a health power of attorney . Can someone with a DoLS have a health POA? The home seems to think not. My husband has been awarded CHC but the Nursing Homes recommended have been unacceptable. Many have very poor CQC reports or Care Workers have told me not to let him go to others. The one I want him to go to means 1 bus ride the others are all 2 with the exception of one which is very poorly regarded locally and another which is for Alzheimer’s patients . They have told me they won’t allow him to go to the one we want as it’s too expensive. However the Nursing Home has confirmed they have some CHC patients. CHC say they only use them in emergency. They have also said he could lose his CHC funding although he only got it 2 weeks ago! Said he is now due another assessment. What do I do? My husband has Atypical Parkinsonian. He is bed bound, and now getting very depressed as the Care Home he is in currently is a long way from me and I have to depend on people to take me there as I don’t drive. The Care Home do not provide Nursing Services. Sorry for the long post but I am starting to feel ill.
Marie – it’s a late reply but it may help. Have a look at this article: http://caretobedifferent.co.uk/continuing-healthcare-funding-and-choice-of-care-home/ Also, Continuing Healthcare (CHC) should never be removed without a full review of all care needs, and with reference to the previous assessment notes. It is only if care needs have genuinely reduced AND if they have genuinely reduced to below the level of the eligibility criteria that CHC funding should ever be taken away. My father has been awarded Continuing Healthcare. No fight, no nothing, but I was well informed thanks to you. But now we are struggling to find a nursing home that have enough staff to take him because of his needs. What happens if no home will take him? He’s in Bristol. Sarah – I’m glad you’ve secured Continuing Healthcare funding. It means the NHS is now responsible for providing care that meets all your father’s needs. If there are no care homes in the local area that can do that, the NHS may have to provide (and fund) extra one-to-one care for your father in any given care home. You should not be left to sort this out by yourself. The NHS has a responsibility here. I am a qualified social worker and i have much experience with CHC and placements. this may sound strange as i am a social worker but a lot of my experience is working within hospitals and completing joint CHC checklists and assessments. I have often argued cases where CHC has been marked down, I often found this was because of the excellent care being provided which masks the extent of the needs. I have also had experience where CHC have not funded preferred homes. Their response has been that there is an suitable alternative at a lower cost. It is so difficult for families to argue their case. I think this website is fantastic and i use it as a resource. Thank you very much for your kind words, Kate. I’m glad the website is helpful. You’re absolutely right that many CHC assessments are wholly flawed because assessors wrongly look at ‘managed’ needs instead of the underlying needs. My Dad who’s 86 has been awarded has been awarded contiuning healthcare. He NBM having to be PEG fed, has diabetes, dementia, double incontinent and is a falls danger. He’s been in hospital since June and varies daily from beiing asleep, talkative but incoherant or talkative and clear. We hoped tp have him home but decided it would be too much for us, we then told about CHC which he was awarded. We were given a list of nursing homes to view visting about seven and drawing up a list of three. One declined due to the PEG, an assessmet was made by one we really like but have been told the funding is too high. The third we are hoping for an assessment. Living in Worxetershire we do not have many nursing homes to choose from. We would like Dad to be somewhere Dad will be safe, comfortable and well looked after and also where there are daily activities, he still likes listening to music and watching films. My concern is that the authority will say yes to the lowest priced home which may be one we think is unsuitable. Is there any way we can challenge their decision? Thanks for your comment, Steve. If your dad has been awarded Continuing Healthcare (CHC) then the local authority should have nothing to do with the choice of care home, as this is an NHS matter. Increasingly, NHS Clinical Commissioning Groups (CCGs) are telling families that CHC has a ‘cap’, i.e. a limit beyond which the NHS will not fund. This is flawed. There is no car on CHC, because CHC should cover all assessed care needs. I know of people in very expensive care homes who receive full CHC funding. One way to move forward is to ask a care home whether they have, or have had, any residents funding by CHC. If the answer is yes, then the NHS cannot justify saying that they will not fund a place in that home.